A comfortable ride. A commitment to safety. 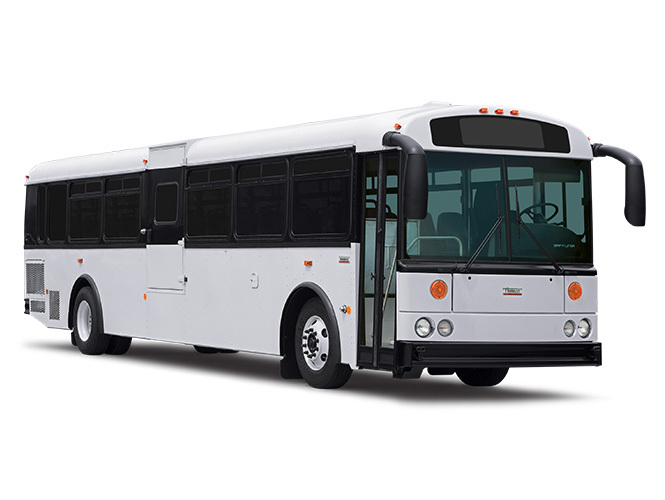 The Transit-Liner® HDX is a transit-style commercial bus that’s designed for comfort on even the longest trips. Heavy-duty shock absorbers take on any terrain, from mountain roads to narrow city streets, while the rear-engine design keeps the ride nice and quiet for the driver. Options like coach-style seating, pass-through under body storage, overhead book racks and air conditioning help accommodate up to 54 passengers. And of course, nothing is more important than Thomas Built’s high standards of safety, demonstrated by meeting and often exceeding FMVSS/CMVSS. All that, combined with one of the most extensive, coast-to-coast dealer networks, makes the HDX city and commercial bus an excellent, long-term, long-journey choice. Decade after decade, Thomas Built Buses has followed one simple philosophy: design and build the kind of bus we’d want our own families to ride in. It’s a simple idea and it works. Passenger safety is our number one priority and every bus we manufacture meets or exceeds all FMVSS/CMVSS for commercial buses.